I must introduce you to Angel, who had her Assessment today at The Fort. She is a seven month old, twenty pound, Puggle and Terrier Mix. Although this picture doesn't do Angel justice, her face does live up to her name lol, she's a real cutie! This kindly little dog-gal, is small in stature yet has a bit of a "wild side". We were told she plays with a German Shepherd quite regularly. Given that info, we chose to let Angel try out The Medium Roll. Once she got settled in there, she meandered, exploring the play area slowly. She soon got to meet with Bogie and Petey, who pulled out all the stops to get her to play. Being that it was her first day at Dog Daycare, Angel was a wee bit timid, and never ended up playing. You could see however, that she wanted to play. 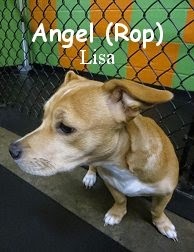 Angel got along just fine with the other dogs, it was just that she was a little over whelmed by the experience. We believe that she just needs some time and consistency, here at Fort Fido, to really blossom. Working with Angel on her slight Separation Anxiety, will also help her become, and stay, the "Dog's Dog" that she truly is. She'll definitely play here, it's only a matter of time... Especially once more of a routine is established at home, and for visiting here. Not a bad job today Angel, we plan to see you again, and see you bust out into some play soon!